I saw this cathedral window pincushion tutorial by Moda Bake Shop and I happened to have a charm pack I received for free when purchasing some other items so decided to try it out. I followed every step except one. Instead of using nine 5" charm squares, I only used five. 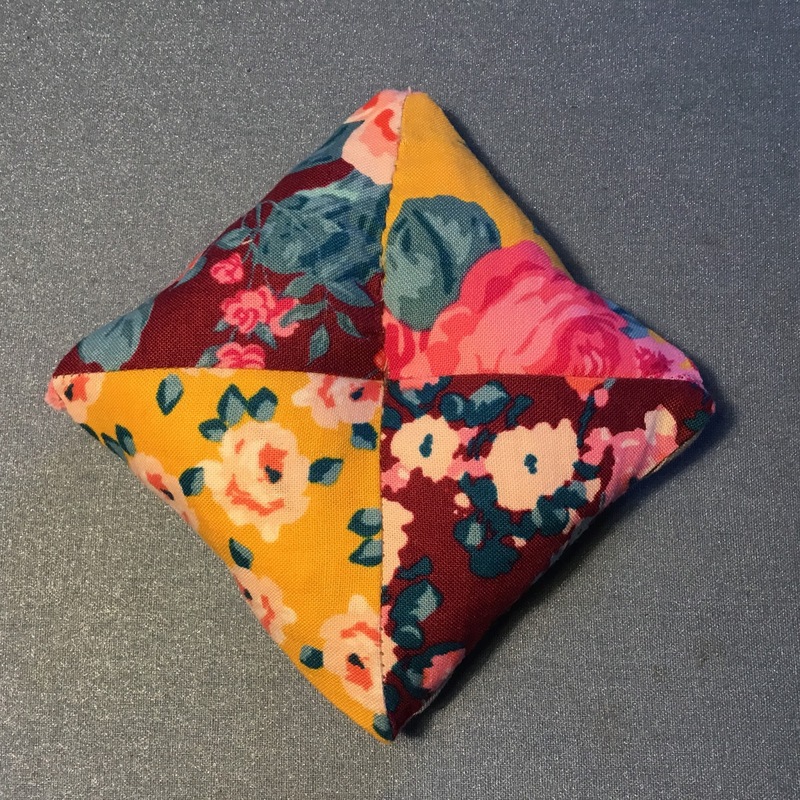 If you sew together the four triangular pieces you trim from the top, you will have a more than big enough square of fabric for the back and who doesn't want to save fabric! I stuffed it with quilt batting trimmings that were less than 1" wide so too narrow to piece back together into usable batting chunks. I used an old button for the centre. If I were to make another one, I would pay more attention to which corner of the fabric I used on top though. 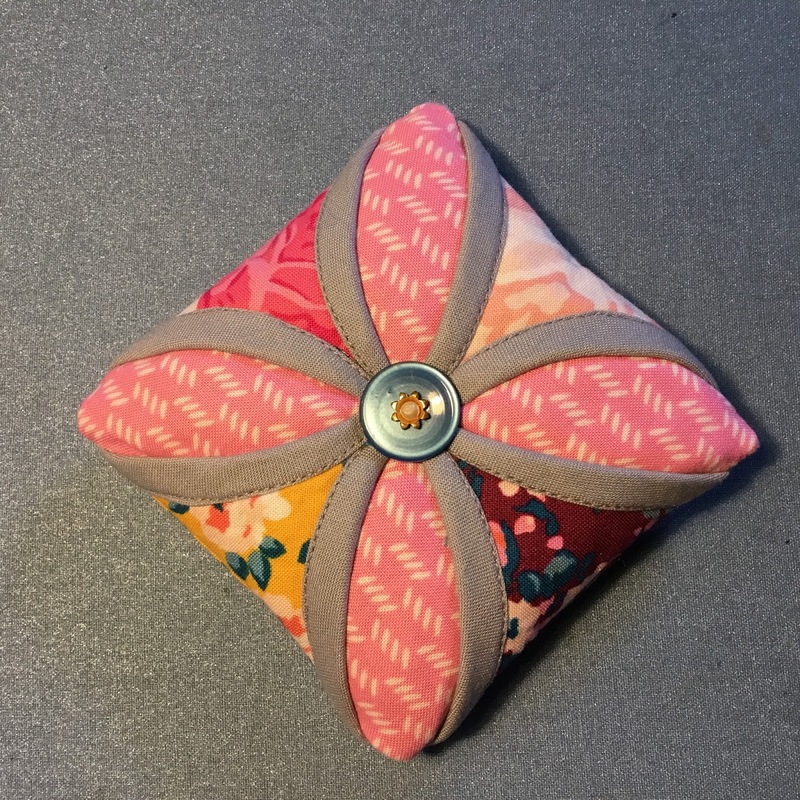 If you look at the back of the pincushion, you can see I used two fabrics with burgundy backgrounds and two fabrics with mustard backgrounds. On the top, however, all you can see of one of the burgundy fabrics is a bright pink flower and all you can see of the other mustard fabric is a pale pink flower. It's fine, but wasn't the coordinating look I intended. The corners are a bit lumpy, but all in all I'm pleased with the result and would make another one. It's hard to believe, but I think this just might be the first pincushion I have ever made! Your pin cushion is GORGEOUS!!! 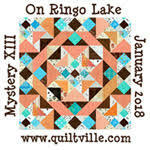 Thanks for posting the pattern link, as I may give it a try.